Our 900VMB vertical steel blaster was used in Canada to clean the wall of ships! 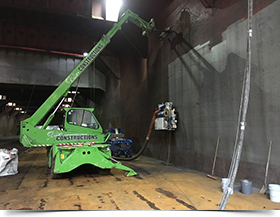 Blastrac recently carried out a project within a ships hold cleaning the walls, using its 900VMB vertical steel blaster. It was use in combination with a mobile crane in order to be used as a winch system. The surface to be cleaned was extremely rusty and still the Blastrac 900VMB generated a nice and clean profile. Despite of the large amount of mill scale on the surface, the machine easily achieved an “SSPC-SP10 Near White Blast Cleaning”. 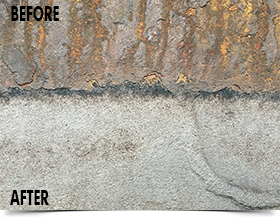 It means all oil, grease, dirt, mill scale, rust, corrosion products, oxides, paint or other foreign matter have been completely removed from the surface by abrasive blasting. You can see below a picture showing the difference between the original surface & the blasted surface. The results were really satisfying and this new blasting process has made history in the Marine Industry in North America and Blastrac believes this will ultimately change the way ships are environmental friendly blasted. The Blastrac 900VMB is a highly effective option over Manual Open Air Blasting. Our 900VMB vertical steel blaster works in closed circuit, so there is no dust released in the environment. Besides, the abrasive is recycled which make the steel blasting process really cost effective. Below is a video of the jobsite. If you want to get more information about the Blastrac 900VMB steel blaster, you can contact your local Blastrac office.